The Fujifilm GFX100 removed all dedicated dials except for one “Shooting Mode Dial“, which will allow you select between stills, multi or movie mode. We had a huge debate about the Fuji GFX100 dial removal here on Fujirumors (includes a poll) and mostly people were not happy at all about it, because they feel that dials and retro-controls are part of the X series DNA. Well, it seems that Fujifilm was not insensible to the mostly negative feedback that came from the FujiRumors community and they now felt the need to explain why they removed the dials. Check the “new shooting mode switch operation” section below. I will add all the screenshots to all the media slides below, but I also write them all down here on FujiRumors, just in case you are watching this on a smartphone and you don’t want to open the slides and keep up zooming in and out to read them… we like to take care of our readers here on FujiRumors ;). available on-time, in late spring or early summer. Sony has just published the flyer with additional details of the IMX461 sensor, the one used by the Fujifilm GFX 100. Cameta Camera interviewed Brandon from Fujifilm about the Fujifilm X-T3 and the Fujifilm GFX100. You can see both videos below. And at the bottom of this article, you find the BHphoto Fujifilm GFX 50R youtube hands on video. Fujifilm GFX 50R Street Photography, Kai Wong Hands On and Could the Fujifilm GFX 100 have an X-Trans Sensor? Jonas Rask shares his impressions of the Photokina 2018 in the best way possible: by sharing wonderful images taken with Fujifilm GFX 50R and X100F. Check out his article “When the floor dust settles” at jonasrask here. Kai Wong was at photokina and shares his walkthrough the various booths. Of course he also checked out the Fujifilm GFX 50R. Jump to minute 5:43 here, to check out the part about Fujifilm. PhoBlographer writes in his Fujifilm GFX 50R first impressions that the Fujifilm GFX 50R is the camera he’s been waiting for. They would like a 50MP X-Trans version and pay even more for it, and faster glass (such as the rumored GF 80mm F1.4) would also be appreciated. Read it all at phoblographer here. Spanish: The Spanish site albedomedia (translation) goes hands on with the Fujifilm GFX 50R. 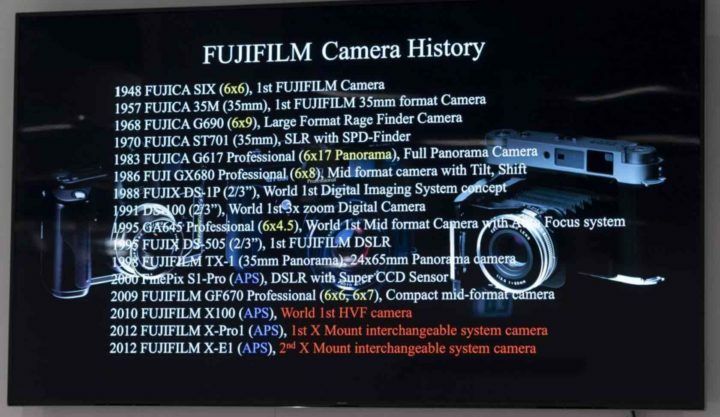 They share their impressions as well as some media slides including an overview of Fujifilm’s camera history, which you can see below. 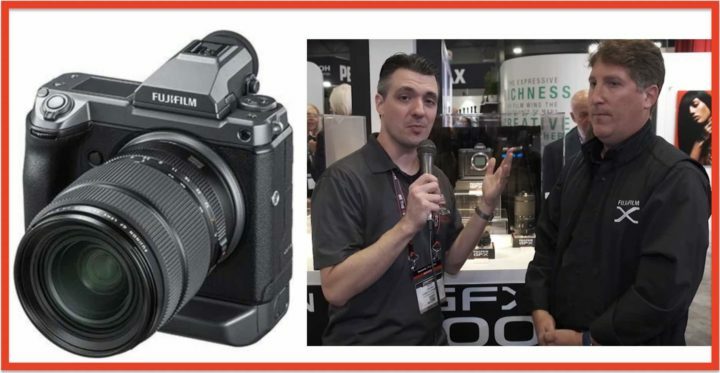 ThePhoblographer had a talk with Fujifilm USA manager Justin Stailey, mainly about the Fujifilm GFX 50R, but there was also a question about the Fujfiilm GFX 100. 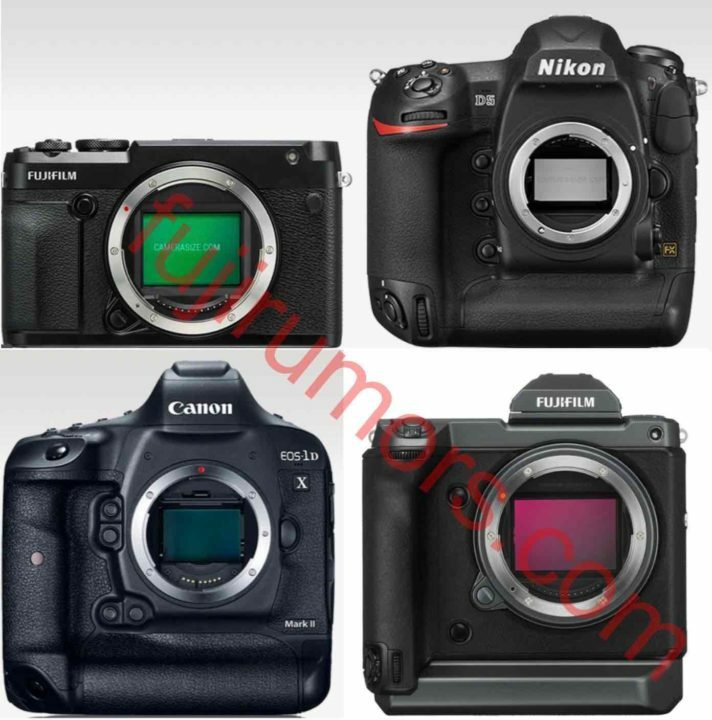 Phoblographer: Why isn’t the GFX 100MP sensor an X Trans sensor? So, despite hinting that a Bayer sensor is more likely than an X-Trans sensor, Fuji Manager Justin did not exclude the possibility it could be a 100 Megapixel X-Trans sensor. Read the whole interview at phoblographer. 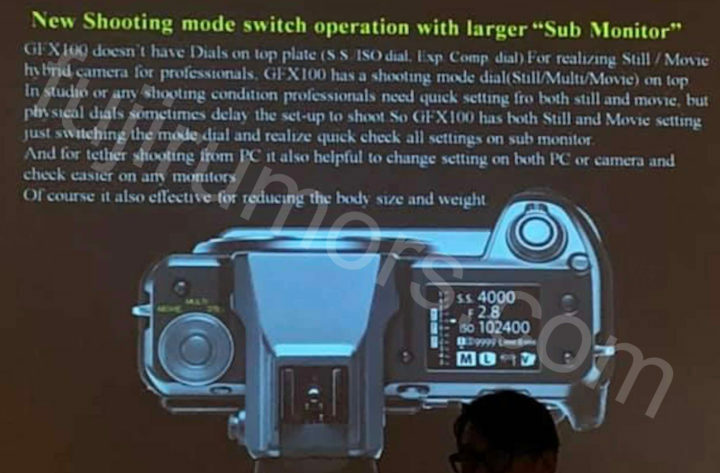 We remind you that the Fujifilm GFX 100 megapixel camera should offer pixel shift multishot, which would indicated that a Bayer sensor is more likely. Read more here. The Fujifilm GFX 100 megapixel camera is big, but how big is compared to other cameras with integrated battery grip, the Nikon D5 and the Canon 1Dx MK II? I thought I am going to check this out in today’s article. Just for fun, I did throw in the brand new Fujifilm GFX 50R in the comparison. The size is about the same of the Nikon D5 and Canon 1Dx MK II, but consider that the Fujifilm GFX 100S has a 1.7x larger sensor in it as well as in body image stabilization (IBIS), and no course no mirror. Seen from the top (images below), the Fujifilm GFX 100S much more protruding viewfinder makes it thicker overall. I remind you, that you can remove the viewfinder on the Fujifilm GFX 100S. Might be handy if you want to store it in the bag, since it makes the camera sensibly sleeker. At the very bottom you can see the real life size comparison between the Fujifilm GFX 100S, GFX 50S and GFX 50R, that I made at during my stay at Photokina. You can see that, with battery grip attached, the Fujifilm GFX 50S is actually slightly bigger than the Fujifilm GFX 100 megapixel. I also added a size comparison between the Fujifilm GFX 100 megapixel versus the Sony A7III, Canon EOS R, Nikon Z7 and Nikon D850, but those cameras do not have an integrated battery grip. Photokina 2018 is history and comprehensively covered for you here on Fujirumors, first with the breaking rumors, then with the coverage directly from Photokina. But just like Fujifilm’s new slogan, also FujiRumors “never stops“. So for me, it’s already time to look into the future in order to keep up with all breaking and exclusive rumors. After having successfully told you almost a year ago (in December 2017) that the Fujifilm GFX 100S will come with IBIS, we now have more details for you. Pixel shift multishot can be used with static subject. The IBIS moves the sensor into different positions and takes several images that it then combines into a single high resolution image (just in case 100 MP is not high resolution enough already ;) ). Currently the Fujifilm X-H1 can’t do pixel shift, as the special X-Trans array might make pixel shift more complicated compared to the convential Bayer sensor. But this does not mean, that Fujifilm won’t figure it out at some point, how to bring pixel shift also to X-Trans. 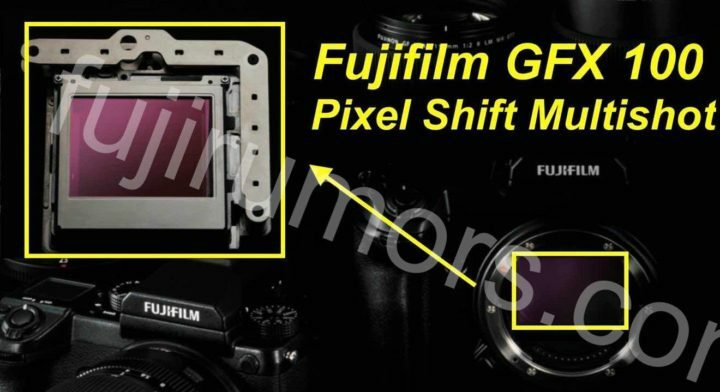 The Fujifilm GFX 100, though, will feature a new Bayer sensor, hence pixel shift might be easier to achieve. The Fujifilm GFX 100 will surely be beast of a camera. Fujifilm has recently announced a new GF lens mount roadmap. 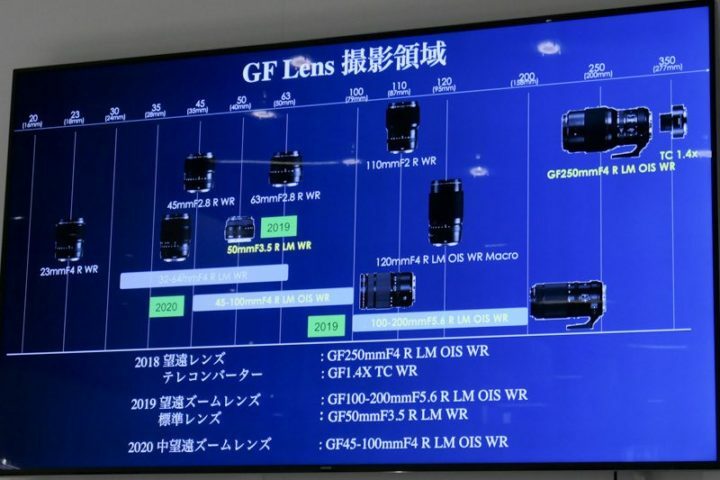 The official roadmap, though, didn’t gave any timeline about when the future GF50mmF3.5 pancake, GF100-200mmF5.6 and GF45-100mmF4 will hit the market. As we told you back in December 2017, Fujifilm plans to release 2/3 lenses for each of their systems (X and GFX) a year. This means that we might see one more lens coming n 2019 for the GFX 50S as well as 1 or 2 more lenses in 2020. Check out our big rumor timeline to see what could come. The slides also give us some basic details about these lenses, which I have all listed at the bottom of this article. Other media slides (also below) show some more details the Fujifilm GFX 100. So we discover that (unsurprisingly) it will feature the X Processor 4 and we can see a first crop made out an image taken with the GFX 100. Don’t worry, of course I did google translate the Japanese description of the slides for your guys. Here on FujiRumors we like to treat you well and save your time ;). Cinema5D interviewed a Fujiflm manager about the Fujifilm GFX 100S concept. You can see the full video here and blog post here.